The Federal Government, under Provincial-Territorial Infrastructure Component – National and Regional Projects (PTIC-NRP) of the New Building Canada Fund, is providing $1,918,862 for this project. The Province is matching this funding under the Strategic Transportation Infrastructure Program (STIP). 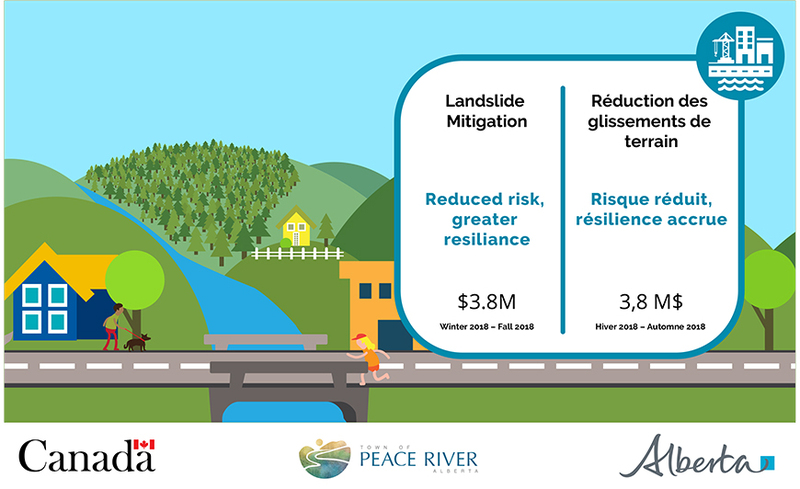 The funding will go to help remediate and stabilize an active slide along 99 Street in the Town of Peace River and repair affected underground water, wastewater and stormwater infrastructure. We are extremely grateful for the support and leadership from the Federal and Provincial Governments. Their timely financial support has ensured we can take swift and effective action to remediate the slide. The support follows an effective lobbying effort from Town Council, including direct conversations with the Ministers of Infrastructure. In July 2016 a geotechnical survey was conducted near 99 Street on land the Town of Peace River was considering for future development. During the course of the survey, the survey team noted surface tension cracks in the area. Throughout the summer of 2016 above average rainfall lead to high levels of soil saturation, likely contributing to the current slide. 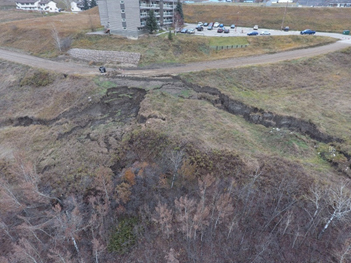 In October 2016 the Town of Peace River retained an engineering firm to investigate the state of the slide area to establish the severity and propose solutions to prevent further progression of the slide. As part of this process, we also took into consideration the risk to local residents and businesses and held public consultation meetings to update affected parties. The slide was discovered to contain three active slide planes and would require two secant pile wall structures to be emplaced. At this point, it became evident that the capital project funds would be insufficient to construct the pile walls and Council took steps to explore grant funding opportunities with both the Federal and Provincial governments. Town Administration submitted a business case in fall of 2017 for grant funding which was approved in December of 2017. As part of this process, two public tenders were conducted for the pile wall construction and the underground infrastructure repair/replacement. The crack formed by the slide is clearly visible in this photograph, taken by a drone in the Fall of 2016. With funding secured for the project, the tenders were awarded in late December of 2017. Over the last month, Administration has met with the successful construction contractors in preparation for this work to begin. This also involved meeting with the Peace River Bridge Construction team to ensure that two projects were coordinated in terms of both resident and construction traffic flow. Mastec Canada from Edmonton, AB were awarded the pile wall construction contract and Macmillan Construction from Peace River, AB were awarded the underground construction and site grading contract.